Ford Racing and the Barrett Jackson Auto Auction have announced that a prototype 2014 Ford Mustang Cobra Jet race car will be auctioned off at the upcoming Barrett Jackson event in Las Vegas - with the proceeds of the auction going to benefit the National Multiple Sclerosis Society. Each year, Ford Racing builds 50 examples of the non-street legal Ford Mustang Cobra Jet drag race package for NHRA Stock and Super Stock competition so they are incredibly rare to begin with but at the upcoming Barrett Jackson Las Vegas Auction set to take place at the Mandalay Bay Hotel on September 26-28, Ford Racing will send a 1-of-1 prototype 2014 Cobra Jet Mustang onto the block. 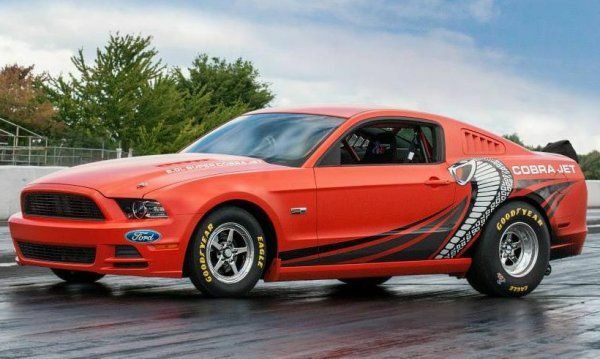 This unique 2014 Mustang drag car is finished in an exclusive (and awesome) matte Competition Orange exterior paint with black and white Cobra Jet decals on the side and hood. This fully loaded Mustang Cobra Jet drag car comes ready to hit the track for full competition with a parachute, lightweight Cobra Jet wheels wrapped in Goodyear Eagle racing skinnies up front and slicks out back, lightweight racing brakes and a safety package that makes this Mustang legal for NHRA Stock and Super Stock competition down the 8.50 ET mark. In addition to the unique paint scheme, the Mustang Cobra Jet being auctioned off comes with a special serial number of 2014 BJMS CJXX1 – signifying that this was the Cobra Jet Mustang auctioned off by Barrett Jackson for the Multiple Sclerosis charity. The proceeds of the Barrett Jackson auction for the 2014 Ford Mustang Cobra Jet prototype will go to the National Multiple Sclerosis Society but for the winner – the prize is greater than just a 1-off Mustang race car and the chance to help out a great charity. The winning bidder will also get what Ford Racing is calling a once-in-a-lifetime Mustang experience that includes an honorary Team Mustang membership and behind the scenes access to the Ford Product Development Center, Ford Design Studios and the Ford Racing Headquarters. The winner will also get training on how to best use the Cobra Jet at the famous Roy Hill Drag Racing School in Sophia North Carolina. The Barrett Jackson Las Vegas Auto Auction starts on September 26th and runs through September 28th at the Mandalay Bay hotel. In addition to providing a great car to be auctioned off for charity, Ford will also offer Ford will also offer “ride and drives” as well as hot laps at the Mandalay Bay Event Center featuring the Shelby GT500 Mustang, Boss 302 Mustang, Focus ST and Fiesta ST along with the Shelby American-built Mustang GT350, Mustang GT500 Super Snake and Shelby Focus ST for rare hot-lap experiences. Based on the BJAA website, the orange Cobra Jet will hit the auction block on Saturday and you can catch that entire day of auction action on the National Geographic Channel from 12 noon to 8pm PDT. Check your local listings for exact times and channels. Ford Racing has put together a short video of the Competition Orange 2014 Ford Mustang Cobra Jet in action at Milan Dragstrip in Michigan and you can check that out below. It comes with some great sound clips of the blown Mustang in action so make sure to crank up your speakers!